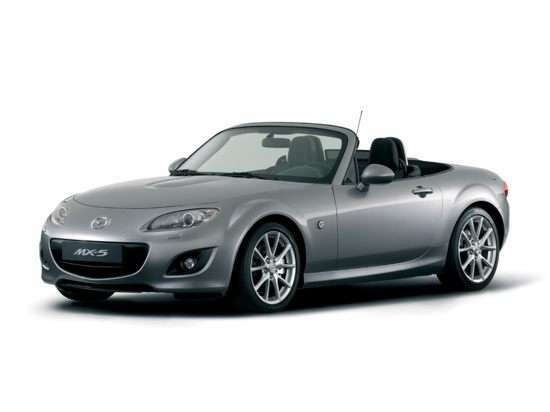 The 2009 Mazda MX-5 Miata is available as a 2-door, 2-seat convertible. Starting at $26,350, the 2009 Mazda MX-5 Miata Grand Touring (M6) Convertible is powered by a 2.0L, 4-cylinder engine mated to a manual transmission that returns an EPA estimated 21-mpg in the city and 28-mpg on the highway. The top of the line 2009 Mazda MX-5 Miata Grand Touring Touring (A6) Power Retractable Hard, priced at $29,290, is powered by a 2.0L, 4-cylinder engine mated to an automatic transmission that returns an EPA estimated 21-mpg in the city and 28-mpg on the highway.